First of all, that cover. I love everything about that cover. And, as such, deciding whether or not to read Jackaby involved me sitting on my hands, dithering about whether or not the insides would match the outsides. As I am wont to do. But the truth is the mash-up of historical fantasy and the Doctor Who-meets-Sherlock Holmes teaser made it no kind of question at all as to whether or not I'd be picking it up. This is William Ritter's debut novel and the first in a series (happy day) as the ending clearly indicates. I picked it up a few weeks back on vacation and read it through in one big swallow. And while my body may have been sitting on the beach, my mind was far away tramping down a cold, winter street in New Fiddleham. The whole experience was deliciously dark and dreary. Of course, it was also ineluctably charming and smart. Which is to say I didn't stand a chance and cannot wait for the next one to come out. The year is 1892. The place: New England. Abigail Rook has fled her staid life. Leaving her disbelieving parents behind in England, she has sailed to the new world, specifically to the dockside town of New Fiddleham in search of . . . she knows not what. Gifted with the ability to parse the importance of ordinary details, she is sure that with a little fortitude (and a lot of luck), she will be able to make a place for herself in this unfamiliar clime. And it turns out, she's right. Her first night in town, she runs across an extraordinary personage who appears to carry an unholy amount of bits and bobs on his person and who goes by the unlikely moniker of R.F. Jackaby. Jackaby, it turns out, is a private investigator of the unusual variety. He takes cases that involve the inexplicable, the paranormal, the ones that regularly stymie the local constabulary. Stumbling into Jackaby's latest case, Abigail is intrigued and finds herself following the odd man home and inserting herself into his daily routine as an investigative assistant. She is, of course, not the first to fill that role (the fate of the last one remains a bit murky) and she fears she will not be the last. But for the present, she can think of nothing else she would rather be doing. And so the two are off as they trace the footsteps of an increasingly erratic serial killer. Abigail and Jackaby are immediate magic. I say that acknowledging that there is not a romantic note between them, though there are a couple of jokes along that vein and their reactions are priceless. There is a lovely hint of romantic potential for Abigail and a certain young detective who is not as disbelieving in Jackaby's ability as his supervisors are. But the hint dances around, remaining in the realm of potential for this volume at least. And that is all to the good, because this entertaining and absorbing debut is a charming and twisty mystery at heart. Chock full of Celtic mythology and regularly terrifying glimpses of the macabre, Jackaby is a recipe for a ripping good romp. I loved how excellently Abigail and Jackaby complemented each other and how quietly but firmly they came to respect and care for one another as colleagues and as accomplices (only when the occasion required, of course). Every scene that features them rambling around Jackaby's home is a delight, as the house itself constitutes one of my favorite characters. The hysterical fate of Jackaby's former assistant, along with the mysterious and heretofore lonely fates of a few of his other lodgers captured my affections. I know why Jackaby chose Abigail, but I was so pleased Abigail chose him. They needed each other. Their enjoyable banter and madcap dashes through the seedy underbelly of New Fiddleham kept me on my toes all the way to the exciting conclusion. As I believe a good book never reveals all its secrets, I know there is much more just waiting to unfurl in the sequel. I am all anticipation. And now for the special Halloween giveaway! Thanks to Algonquin Young Readers, we have 3 signed first editions up for grabs. This giveaway is open to those with U.S. or Canada mailing addresses. To enter, fill out the Rafflecopter. The giveaway will be open through Friday, November 7th. Books Take You Places - "Jackaby absolutely delivers." 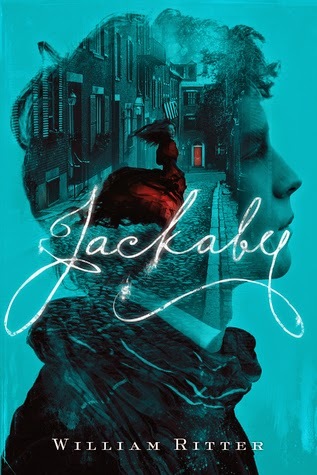 Bookyurt - "Jackaby is without doubt a solid and entertaining debut." Forever Young Adult - "If you like your consulting detectives with floppy hair and their partners with a sassy attitude, then William Ritter’s debut novel Jackaby is for you." Good Books and Good Wine - "I think that if you’re jonesing for a historical mystery with a barely there hint of romance with a super high focus on the actual mystery and clues itself, you’ll really love Jackaby." Nerdist - "It’s exactly the thing you want to curl up with a cup of tea and inhale in a window seat on a rainy autumn day." That's What She Read - "Jackaby is a thoroughly enjoyable, rollicking adventure, with tongue firmly in cheek." I would say Sherlock, he's a classic! Here is where I step into the light and admit that I just barely finished watching Sherlock (and I adored it), but never have seen a single episode of Dr Who. For which I feel nagging guilt. But I also just discovered the Gilmore Girls, so apparently there were gaps in my TV watching. Where does a Dr Who virgin start, anyway? Thanks for the the review of Jackaby--this one seems destined to be read, and soon. YES! I loved that there was NOT a romance between Jackaby and Abigail. I feel like I need to watch Sherlock and Doctor Who though. AND OMG I am excited for the sequel! I always go Sherlock because he is…Sherlock. Since I live in the middle of nowhere and don't have a TV... definitely Sherlock. If I do get a Tv though, one of the first things I'm watching is Dr. Who. By a very small margin...Dr. Who!